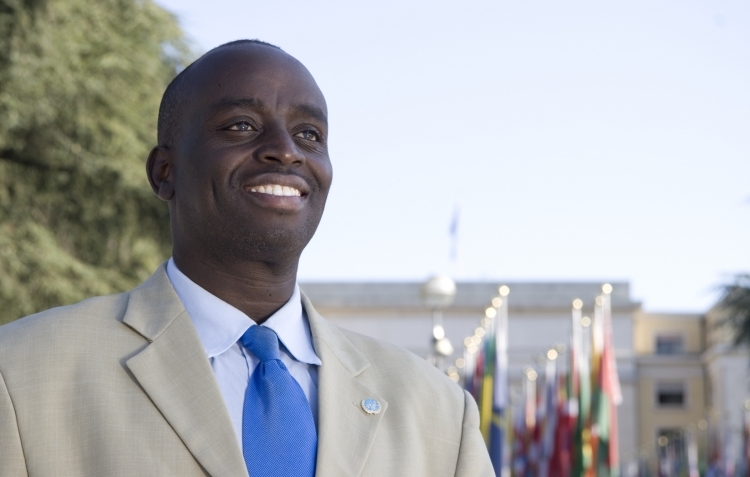 Chris Mburu, international human rights lawyer currently serving with the United Nations as a Senior Human Rights Advisor, is visiting Kenai, Ninilchik, Port Graham, and Razdolna schools, November 16 and 17, 2017. Originally from a small village in Kenya, Mburu benefitted from the generosity of a holocaust survivor named Hilde Back who sponsored his education. Thanks to her philanthropy, he successfully completed secondary school, went on to college at the University of Nairobi and Harvard Law School. He continues in this philanthropic vein through an education fund he began in her name. The Emmy nominated film, A Small Act, tells this story. For the last 20 years, he has worked extensively in the areas of human rights, governance, democracy, rule of law, transitional justice, peacekeeping, and conflict resolution. Joining Chris Mburu will be Kimani Nyambura, a young man who benefitted from the Hilde Back Education Fund, and is now attending college at Washington State University in Richland, Washington, USA. KPBSD families and the community are invited to meet Chris Mburu and be inspired by his story. Bonus: in Kenai on November 16, everyone will also view the Emmy-nominated documentary, A Small Act, which shares his powerful story. Mburu is committed to justice in action and education as a human right. Chris Mburu and Kimani Nyambura will speak to students and community members at the school from 9:45 – 10:30 a.m. The morning will culminate when the cross-country team runs through the village wearing Education is a Human Right t-shirts from 10:30 – 11:00 a.m.
Join Chris Mburu and Kimani Nyambura for a reception and hear them speak from 5:00 – 6:00 p.m., followed by a film screening of Emmy-nominated documentary, A Small Act. Everyone is welcome! Free. Chris Mburu and Kimani Nyambura will visit Ninilchik School to speak. This is open to 7th – 12th grade students, parents, and community members. Chris Mburu and Kimani Nyambura will visit Razdolna School to speak. Everyone is welcome. Education is a human right, and small gestures of kindness and giving can change individuals, families, communities, societies, and the world at large. Thank you to Project GRAD Kenai Peninsula for sponsoring Chris Mburu to the Kenai Peninsula. An international human rights lawyer currently serving with the United Nations as a Senior Human Rights Advisor. He graduated with a Master’s degree in law from Harvard Law School, where he had focused primarily on international human rights. For the last 20 years, he has worked extensively in the areas of human rights, governance, democracy, rule of law, transitional justice, peacekeeping and conflict resolution; he has served in many countries including USA, Switzerland, Democratic Republic of Congo, Sierra Leone, Somalia, Uganda, South Africa, Burundi, Ethiopia, Cuba, Rwanda, Kenya and Eritrea, mainly with the UN. He also served as Senior Advisor and later Acting Director for the UN Regional Center for Human Rights and Democracy in Yaoundé, Cameroon. Outside of the UN, Chris has served as an expert with leading human rights organizations and policy think-tanks, including Global Rights, the International Crisis Group and Amnesty International. Outside of his professional work, Chris founded a charitable organization in Kenya in 2001 which he named “The Hilde Back Education Fund” (www.hildebackeducationfund.com) in honor of a Swedish woman called Hilde Back, a Jewish holocaust survivor who sponsored his education when he was a poor needy child growing up in rural Kenya. The story of Hilde and Chris became became the subject of an Emmy-nominated Hollywood documentary film called “A Small Act” (www.asmallact.com), which premiered at the Sundance Film Festival in 2010 and went on to win several awards. Chris’ charity has supported the education of hundreds of poor children and inspired the creation of “small act” initiatives in different countries. This entry was posted on November 10, 2017 at 12:51 pm. You can follow any responses to this entry through the RSS 2.0 feed. You can leave a response, or trackback from your own site.